CATICOAT is a primer for the deck slab waterproofing layer in bridge surface paving. It is solvent-based, and there are the following three types depending on the deck slabs and the application. 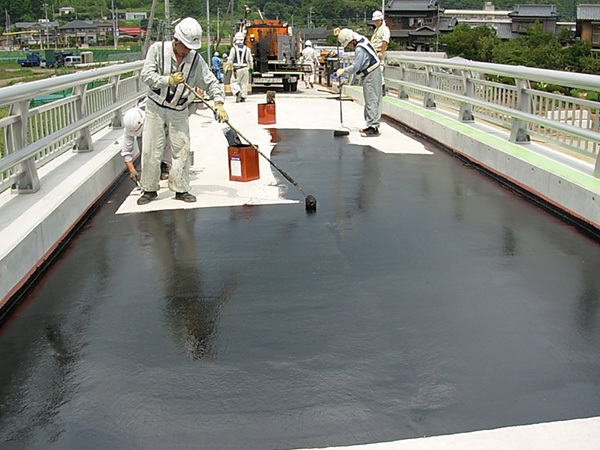 Each type conforms to the standard properties and conditions for solvent-type primers in the “Bridge Deck Slab Waterproofing Handbook” (Japan Road Association). Ideal for use as a primer in a situation when implementing a waterproofing layer on steel deck plates on road bridges, or when implementing guss asphalt paving. Has outstanding waterproofing and rustproofing abilities. Has quick-drying abilities, so that the curing time can be made shorter than for CATICOAT S.
Because it deeply penetrates into the concrete and forms a hard coating, less pinholes will be generated and the coating will have outstanding durability. Due to the excellent adhesion with the waterproof layer, the waterproofing performance will be improved. Quick-drying primer for repair work or nighttime construction work that is subject to time restrictions.